Review their vaccination history if they have not previously had the measles; people who have not had measles or the measles vaccine are at higher risk after an exposure, so they should talk with a health care provider about receiving MMR vaccination. Monitor themselves for illness with fever and/or an unexplained rash from 7 days to 21 days after their exposure (the time period when symptoms may develop); if symptoms develop, contact a health care provider immediately. Measles is a highly contagious and potentially severe disease that causes fever, rash, cough, and red, watery eyes. 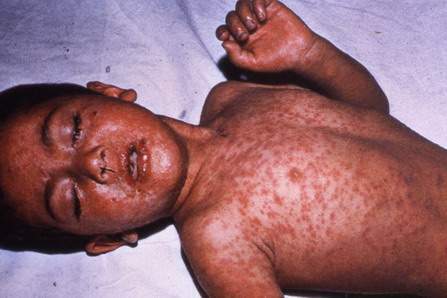 Measles spreads very easily by air and by direct contact with an infected person. Measles is contagious from approximately four days before the rash appears through four days after the rash appears. Measles is a rare disease in the United States and in regions of the world where vaccination coverage is high. Maintaining high vaccination rates is vital to preventing outbreaks of disease in our community. To learn more about measles, visit the Centers for Disease Control and Prevention or the Orange County Health Care Agency.